We had a little movie spree a few weeks ago when we enjoyed a 3-day staycation with our sons and then the following week, our niece came to visit. I'll mention the second movie first. One night, it was just me, my 24-year old son, and my 16-year old niece, and everyone was worn out and wanted to watch a movie - but what would appeal to both of them?? They have very different movie tastes. 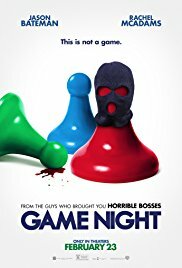 I ended up with a movie I'd already seen this summer, but I though they'd both enjoy: Game Night, starring Jason Bateman and Rachel McAdams (you can read my review at the link). Great choice! They both loved this unique movie that combines suspense and humor, and I enjoyed it a second time, too. It's still for rent on Amazon, if you're looking for a crowd pleaser! So, going back to our staycation, we had another tough crowd to please because our sons don't always like the same movies. So, we reached back in time and watched Jurassic World - not the new one out this summer, but the one from 2015. We'd never seen it before, and everyone agreed on it! 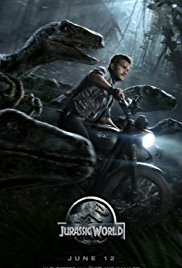 Set 22 years after the events in the original Jurassic Park movie, this movie takes place on the original site, where a fully-functioning theme park called Jurassic World is now in operation. They've ironed out the problems and made the park safe (they think) for all the tourists that flock there to see real dinosaurs. Bryce Dallas Howard (Ron Howard's daughter) plays Claire, who is the busy operations manager of the park. Her nephews, Zach and Gray, come to the island to visit, and get a tour of the amazing facilities. The research side of the operation has been working on a hybrid dinosaur - bigger and scarier than any other they have - called an Indominus. Meanwhile, Owen (played by Chris Pratt) has been carefully training the raptors so that they recognize him and respond to his commands. Owen evaluates the new Indominus and its enclosure and doesn't think the exhibit should be opened to the public because it's too dangerous and not secure enough. And guess what? He's right - the Indominus gets out and goes on a killing rampage, chewing up workers, tourists, and other dinosaurs indiscriminately. Zach and Gray are out in the park, so Claire and Owen go in search of them. It's a pretty predictable plot but lots of fun to watch - giant dinosaurs terrorizing people, right? Of course, both Howard and Pratt are fun to watch, too - wait until you see Howard run from dinosaurs in her stilettos! (seriously, kick off the damn shoes when a dinosaur is chasing you!) It's what you'd expect from this franchise - loads of action, suspense, thrills, and peril. We all enjoyed it - it's just pure fun escapism, which was just right for our staycation. I was surprised to read just now that this is actually #4 in the Jurassic Park movies - I guess I missed a couple of them in the middle. And by the way, if you've never read the original novels by Michael Crichton - Jurassic Park and The Lost World - you should! They are both excellent. You can stream Jurassic World starting at $2.99 on Amazon or watch it on DVD.